I think that maybe my mates and I should join “The A Team” cos hell I love it when a plan comes together. 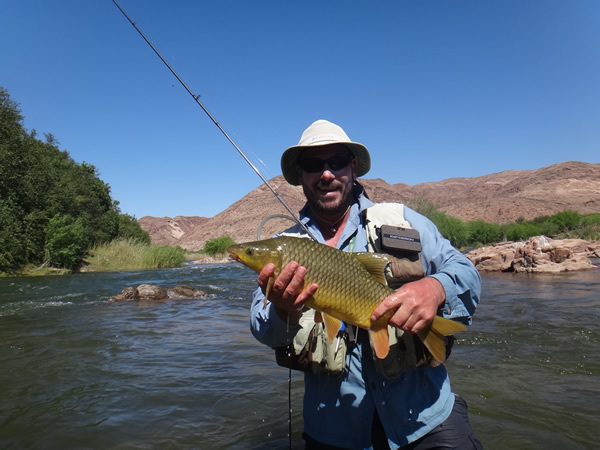 We had been talking of exploring parts of the Orange River, previously unknown to us for some time. The debates of when to go, should we go and even should we perhaps settle for something more known to us dragged on until the decision was made. Fishing time is precious and one doesn’t want to waste time and energy in the wrong spot. But then there is also the question of forging your own path and taking some risk and in the end that is exactly what we did. Armed with maps, GPS and plenty of fishing gear we headed out into the desert some 600 odd kilometers from home, not sure that we would even find the river. 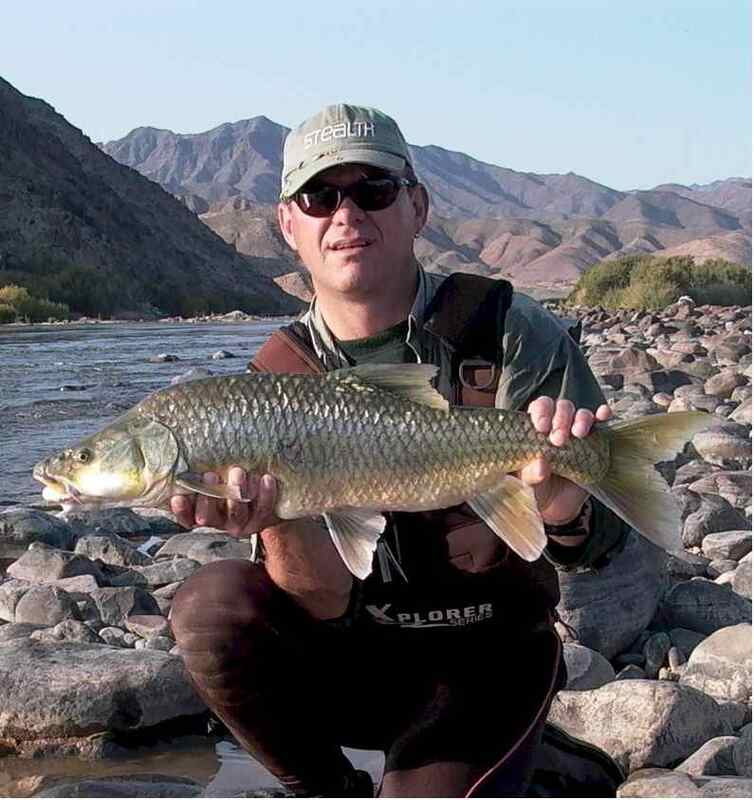 Deserts are not the places most people consider as venues for quality fly fishing and although we knew that the Orange River was there there was little guarantee that any of the trails would put us close enough to reach it. 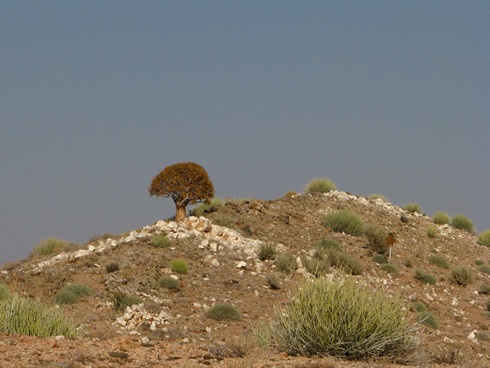 Desert Landscape, not exactly the place you expect to find fish. 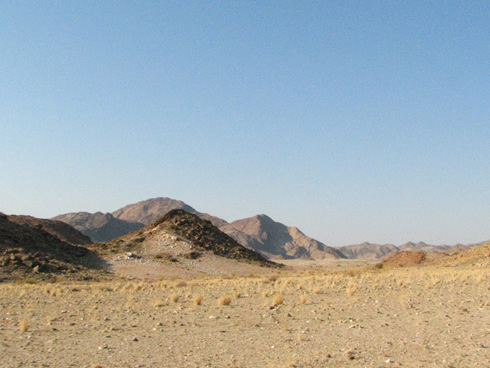 Previous trips to the Richtersveld reserve nearby have been productive, but the landscape there is scared by monuments to man’s unassailable greed, massive mine dumps the result of the search for diamonds and as a consequence it lacks something of the raw splendor of our new destination. 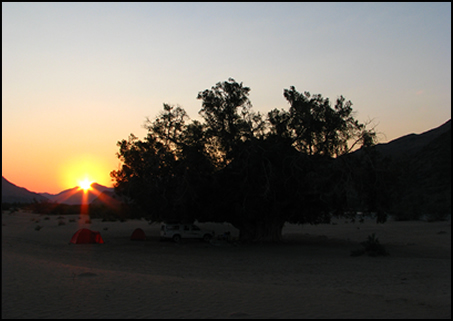 We hit the desert after an all night drive and were greeted with a spectacular dawn, low angled winter light softening the harshness of our surroundings. 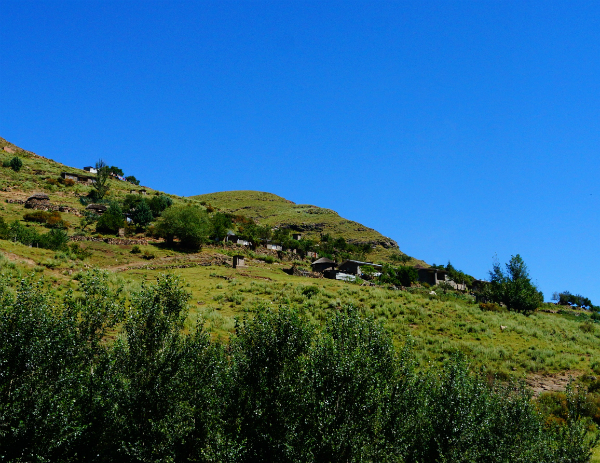 First stop was a small settlement called Henkries where one can obtain the odd essential item from a shop that is little more than a house’s garage, sparsely stocked with a coke fridge and the odd bar of soap, the nearest thing to a town that we would see for five days. 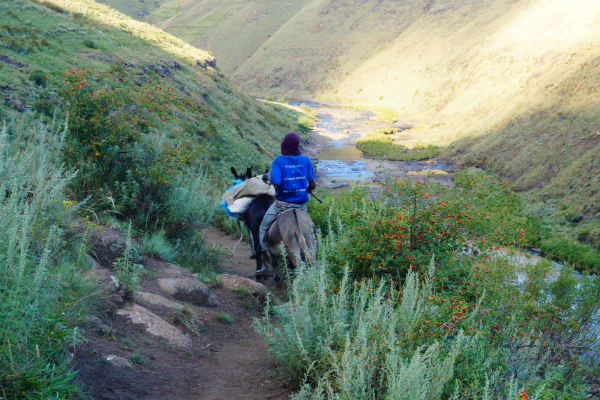 The trail requires that one loop around the mountains to touch with the river here and there and at the first stop we found both a wonderful campsite at the water’s edge and what appeared to be a decent rapid. The fishing was however disappointing, we got some fish and at least didn’t spend the first night under canvass with blanks on the scoresheet but it wasn’t as good as we had hoped. 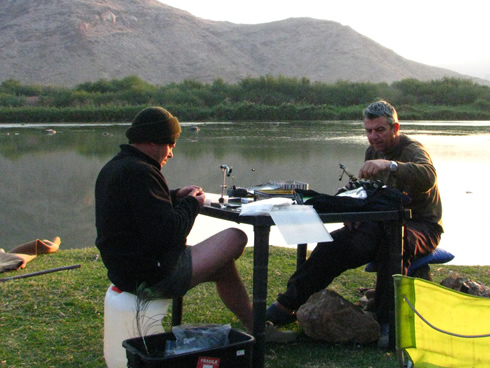 Fly Tying Alfresco: Albe and Mike whip up a few nymphs at the waterside camp. You hook two fish at the same time. You and your partner both hook fish at the same time. You hook fish on consecutive casts. 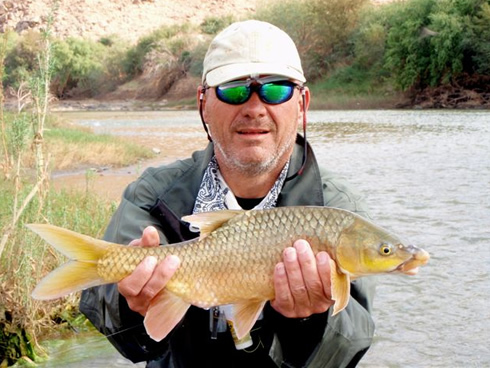 Albe Nel, trying out for the Al-Qaeda fly fishing team, with a baby largemouth Yellowfish. The "Buff" was actually an anti fly swallowing measure. On this stretch, after several hours of trying other water for only a fish a piece we managed all of the above in short order and proceeded to “hammer em” for several hours. 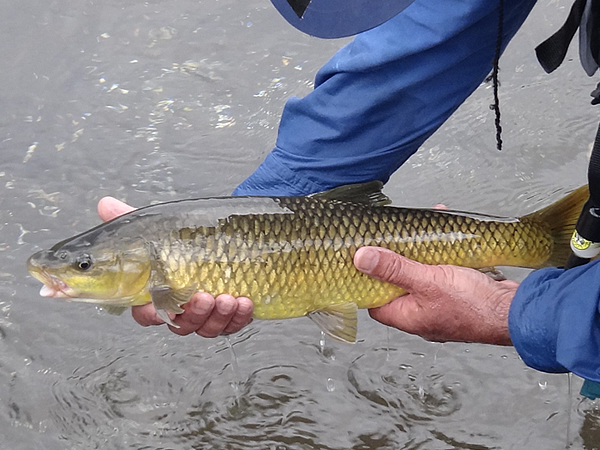 Odd that other good looking water nearby produced very little but this stretch really did hold huge numbers of fish and we were well pleased with the results. A lengthy walk back to camp through the bank-side vegetation and the flies that inhabit it virtually terminated my long standing vegetarian status and the numbers swallowed would no doubt have added up to a decent steak in terms of protein but we were happy, we had found fish and been able to test out some tackle and various rigs to good effect. Mike and Albe returned to the hot spot for the afternoon whilst I decided to play with some alternative methods in the water nearer to the camp. 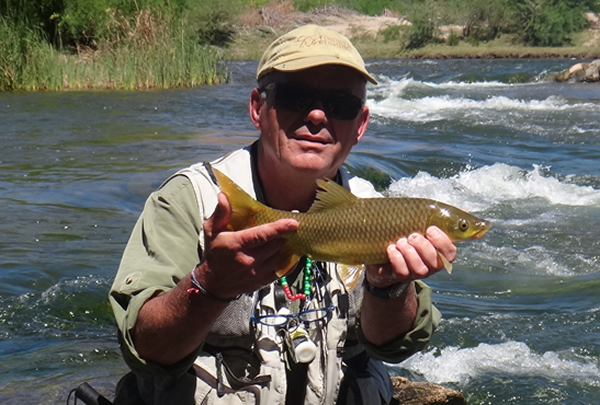 The result was that I took only a single fish for the session whilst they had bent rods for most of the afternoon until they tired and returned for sundowners much later. 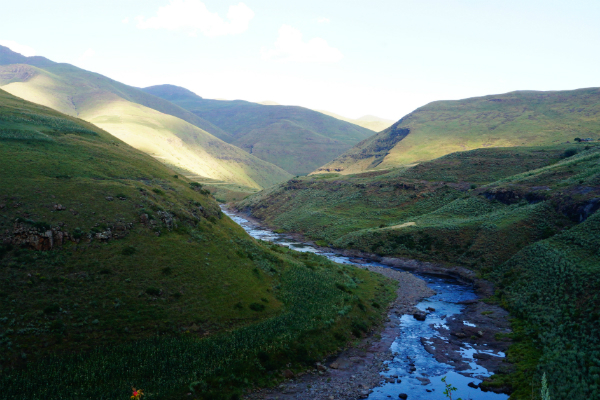 The morning saw us once more on the trail, this time another loop around the hills, driving in an environment where one seriously questions the wisdom of being in a solitary vehicle. The chances of walking out alive should there be a mishap not appearing particularly good, miles and miles of sand, broken rock and shattered quartzite which looks for all the world like broken glass. In fact the illusion is of driving over a massive land fill site. 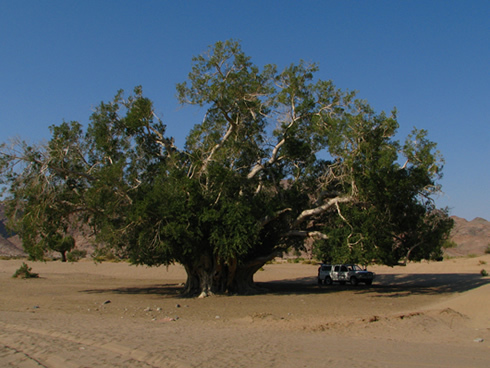 Camping desert style, this is probably the biggest tree for miles. 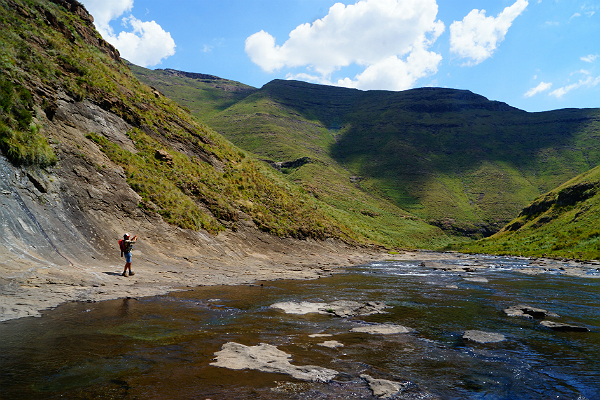 We reached our new destination by late afternoon and were able to see a glorious rapid not far from the camp. 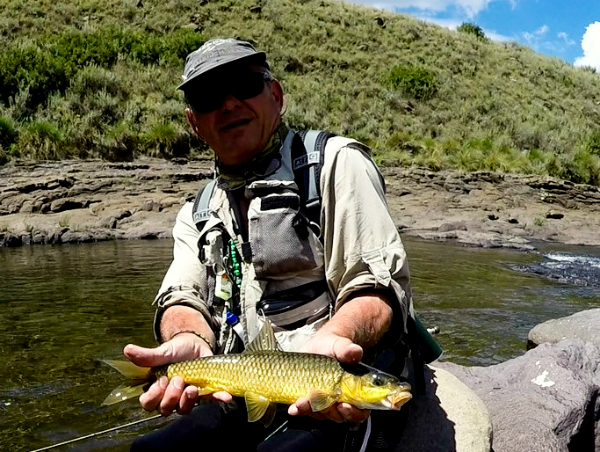 Again the results were disappointing, some fish but not a lot of them and treacherous wading in the lower sections. 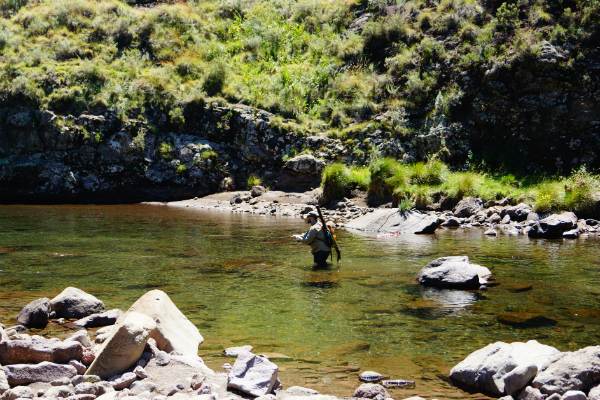 It was however the first time on the trip that I was totally out of control, a good sized mudfish taking yards and yards of line down the raging currents necessitating a precarious chase over the sunken boulders. 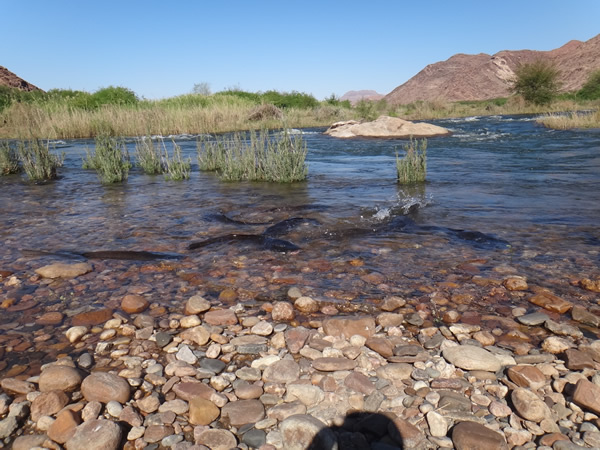 We fished the same rapids the following morning, did a bit better having located a few nice holes but still we were taking fish by the dozens and we wanted more. An almost desperate search higher upstream where the water looked flat and wide however revealed a maze of small channels amongst a smattering of islands and here we found fish. In fact we found fish in abundance, that first evening we landed over thirty fish a man in less than a couple of hours and returned to camp in the near darkness, not wishing to stop. Mike with a nice fish from one of the channels. This proved to be the highlight location of the trip and we returned to explore the channels and islands several times. We still never got to fish all of the water available however and there is good reason to return. 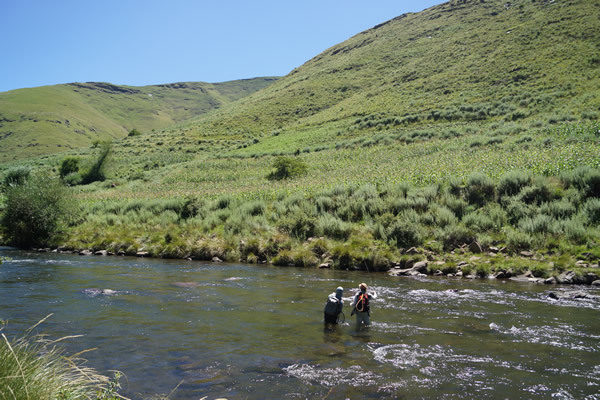 It is difficult to estimate and we didn’t keep count but at a guess the three of us took somewhere between 700 and 900 fish including the slow days when we were searching for the right water. 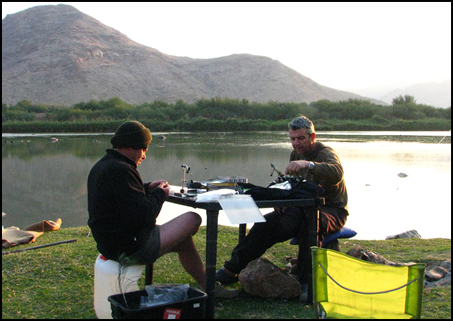 By the time we were finished we had learned a lot , refined our tackle, methods and perhaps most importantly where to locate numbers of fish. 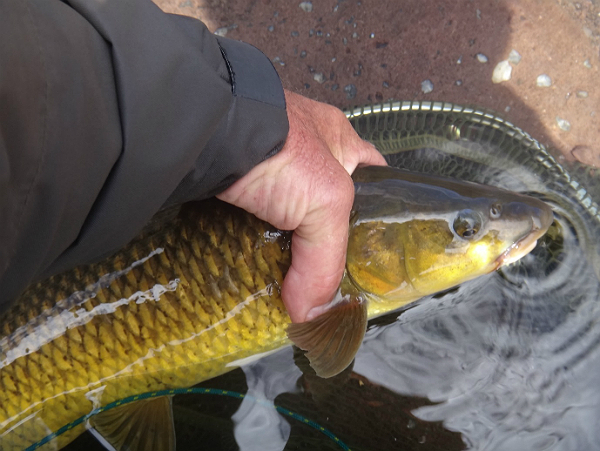 This was some of the best yellowfish fishing I have ever enjoyed anywhere, the only possible lack was that we didn’t land any that were truly massive although I think we all lost at least one real lunker at some point. Part of the journey, consider having to walk out of here. 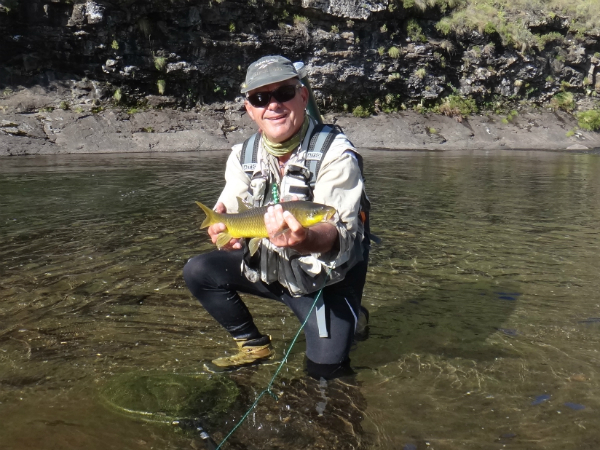 The final mornings fishing was an affair of mixed emotion, we continued to catch fish in numbers, in fact a day or so before I had managed to take nine yellowfish on consecutive casts if that gives some indication of the quality of the venue. 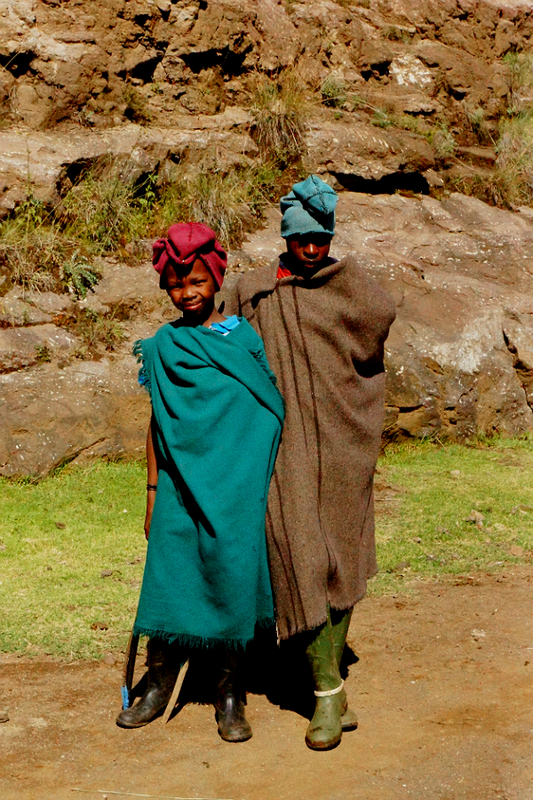 In the end we had to pack up camp and head back to civilization. 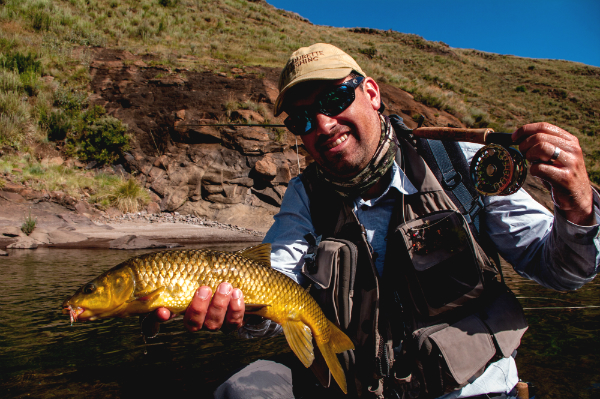 It is hard to walk away from that kind of fishing, all the more so when you know that it could be a year before you return but the experiment paid off, we worked hard, covered a lot of ground both in the vehicle and on foot and in the end the plan came together. Absolutely awesome fishing, the only crowds the occasional herd of goats, the only competition from the resident fish eagle and the otters which had left tracks all over the sand bars and which we actually saw on one mornings excursion. 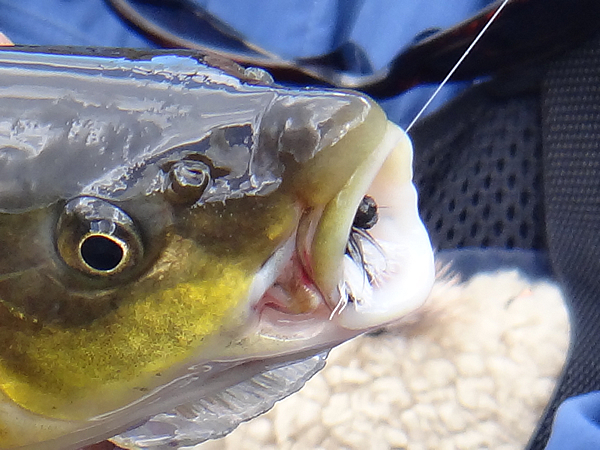 Myself and Albe taking two largemouth yellowfish at exactly the same time. Catching nine fish on consecutive casts. Albe catching a fish with the leader in his hand and not attached to the line. Sharing such an amazing venue with incredible anglers and good friends. Collectively taking seventeen fish from a run the size of two bath tubs. The desert stars at night and the amazing sensation of space. Spotting Otters in the river. 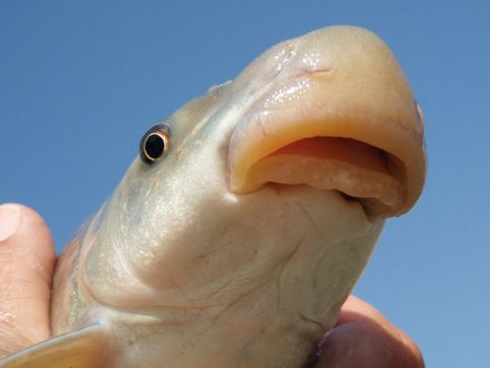 The bizarre looking mouth of an Orange River Mudfish. First person to take the royal flush: muddy, smallmouth, largemouth and barbel.. “currently vacant”. 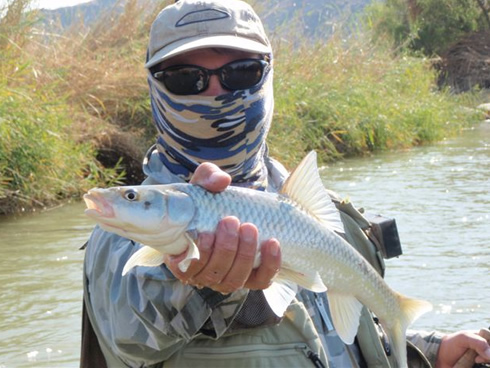 Best landed fish of the trip… Albe. 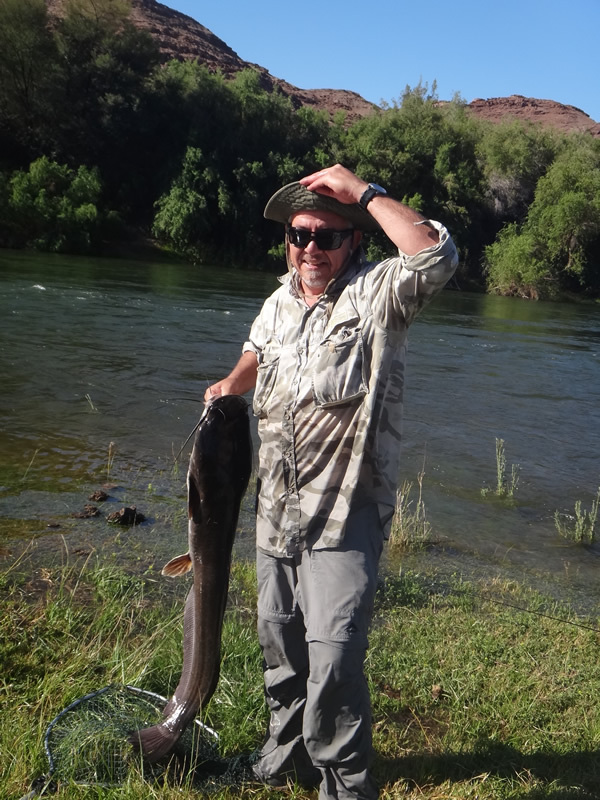 Albe Nel with what was almost certainly the best fish landed during the trip. 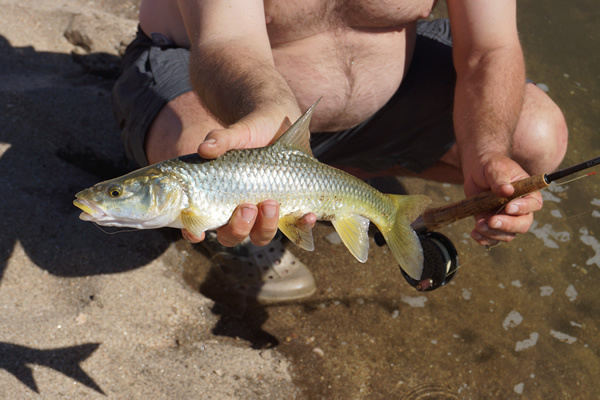 So there it was seven days, nine hundred odd fish, some great exploration, and the gamble of either a watery or firey death in the river or the desert if something went wrong. I think by the last day we would have gone in peace, this was the fishing trip of a lifetime, or until we return it will be. Best wishes from the “A Team”. A phone call and thoughts switch from browns to yellows and this isn't snooker. Well that’s really torn it, there I was churning out dry flies in preparation for the coming season. 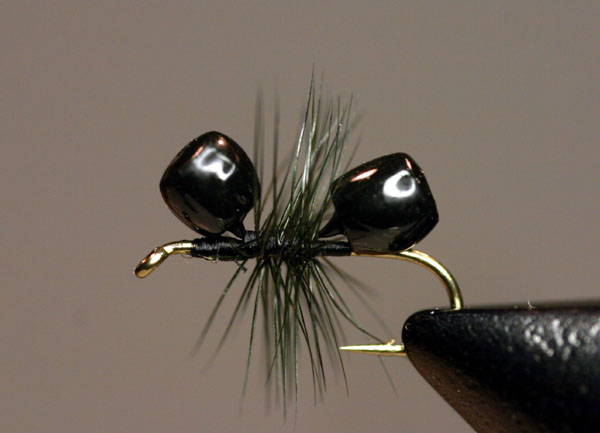 Caddis Caddis, Caddis….. Parachute Parachute… and really rather getting into the swing of things. 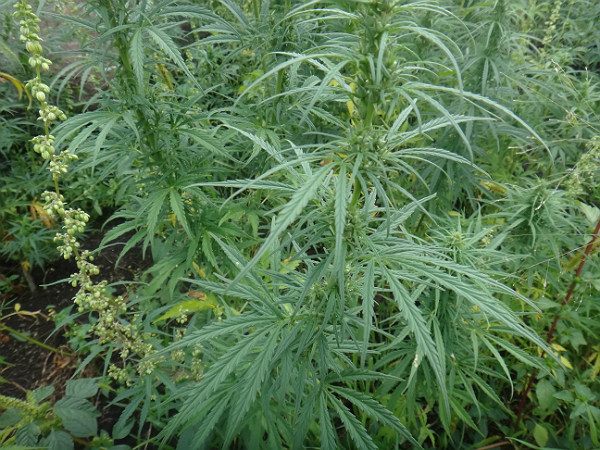 I had already got down the some of the micro patterns and given that I start with the larger sizes first that indicates some sort of progress. In fact I probably had well over two hundred brand new caddis patterns in the box and was about to move on to the mayflies when the phone rang. Now it isn’t as though the call was an unwelcome intrusion, not at all, it is just that, as I was saying, I was in the swing of things and rather looking forward to starting the season on the rivers with a well stocked fly box and spoiled for choice no matter how ornery the fish were being. The call was from my very good mate Mike and the essence of the phone call was to say “we’re on”. 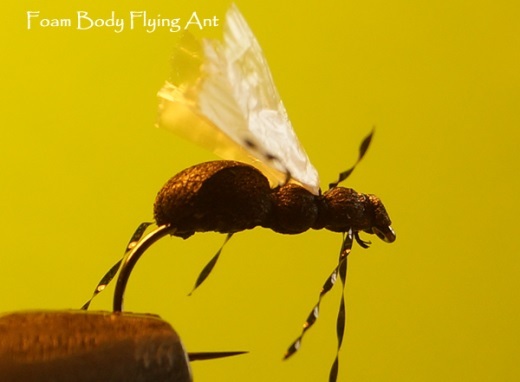 There is a lot that can be conveyed in a few words and those two admittedly foreshortened gems changed the pattern of my thinking and the pattern of my fly tying in one fell swoop. 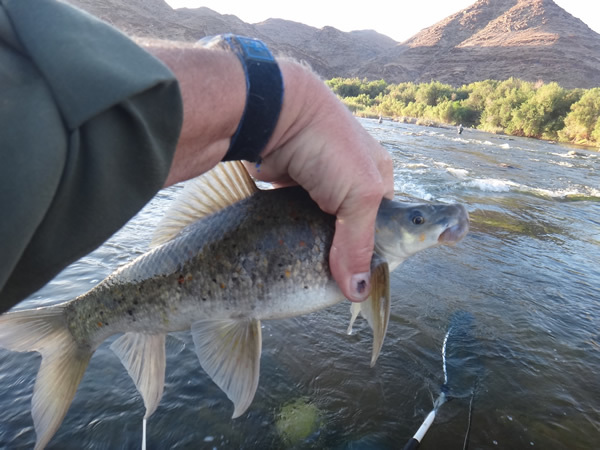 You see we have been talking about heading back to the Orange River in pursuit of Largemouth and Smallmouth Yellows and now after months of debate and false starts it appears that all the potential participants had managed to get ducks in a row, gain leave of absence from work and loved ones and we were going. A sudden switch from Elk Hair to Tungsten Beads was needed. 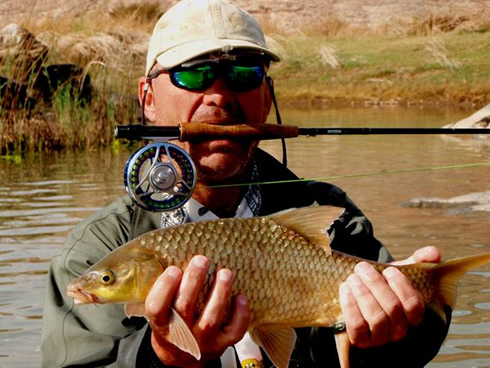 For those unfamiliar with Southern African fly fishing, we have a number of unique aspects to our fishing amongst them several species of Yellowfish. 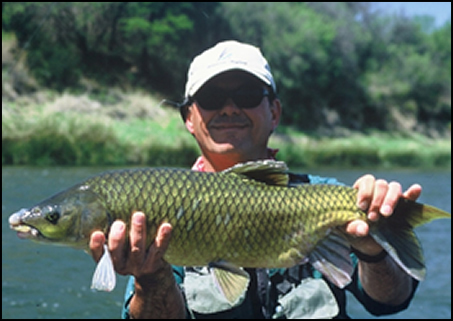 If you don’t know what yellowfish are let’s just say that they are like giant carp designed by Enzo Ferrari. 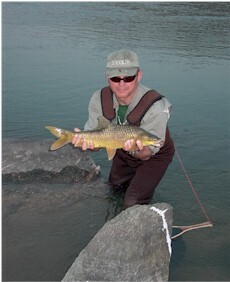 The smallmouths can reach well over ten pounds and the Largemouths well over that many kilos. 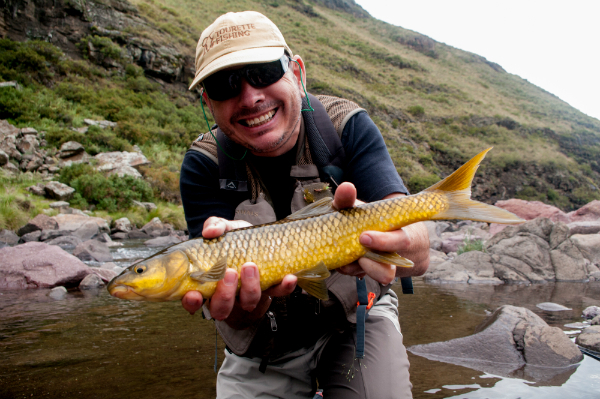 They love large rivers and fast water, they have massive tails and pure muscular bodies and they take flies. In fact they take flies really rather well so long as one has the right techniques. 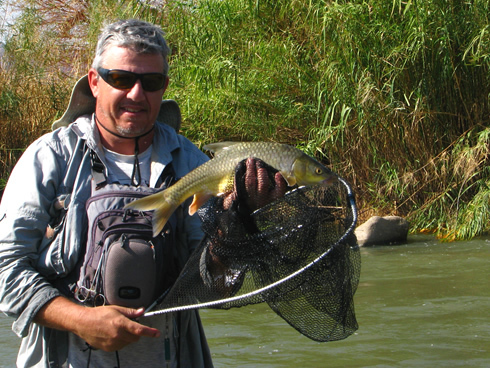 The Author with a decent Largemouth Yellowfish. Which conveniently brings me back to the disruption of the fly tying, not only were we going but we were going in less than a week’s time and here I was tying micro caddis patterns when now what I needed were Czech nymphs and lots of them, preferably sporting lead and tungsten accoutrements. 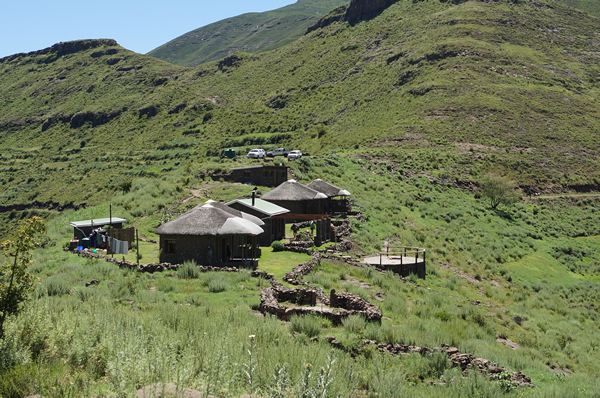 Of course I am excited to be going, we are headed for the Orange River at a point where it is the border between South Africa and Namibia. 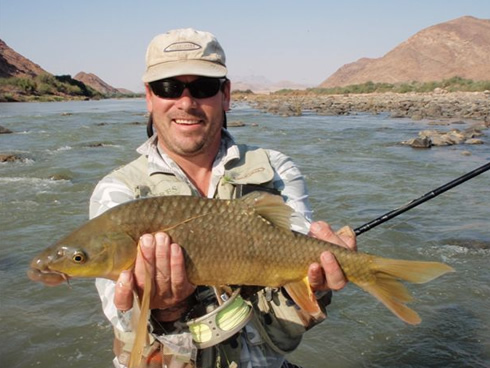 One of the few disadvantages of living in Cape Town is that we are not near good yellowfish fishing, the guys up in the big smoke of Johannesburg have yellows on their doorsteps, but then they don’t have good trout fishing and we have better scenery. So in something like six days time we are going to be driving for around eight or so hours and ending up in a desert where there are no facilities at all. That means that I have less than a week to wind up work commitments, write at least one newspaper column, pack tent, utensils, cooking gear, rods, reels, lines, boots waders .. etc etc etc and of course those flies. 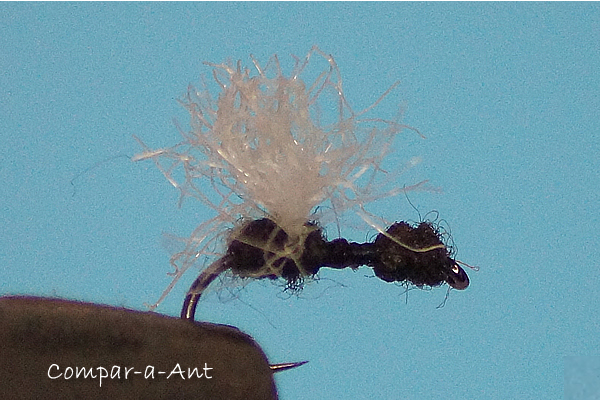 So the size 20 dry fly hooks were put back into their place and I started strapping Czech nymphs with abandon. The fly tying room, only recently tidied out now looks like a bomb hit it again and in less than two days I have managed to add about a hundred and ten yellowfish flies to my box. Whether that is enough I am not sure but pretty soon I am going to have to focus on other stuff, flies are important but I need to buy some food too, Oh and pack some clothes as well I suppose. 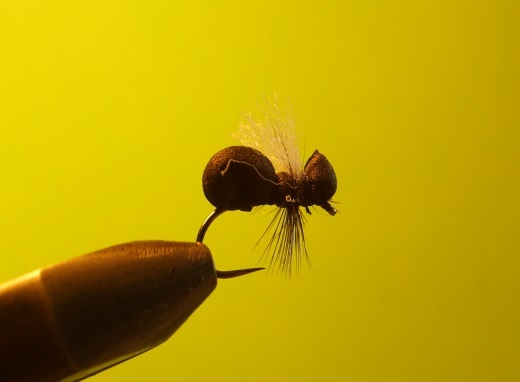 What makes it tricky is that although the fish are frequently not that selective, having the correct weights and sizes of flies for various water conditions is critical and a few flies of different styles or colours , in a few sizes in a few different weights pretty soon adds up to a boxful. 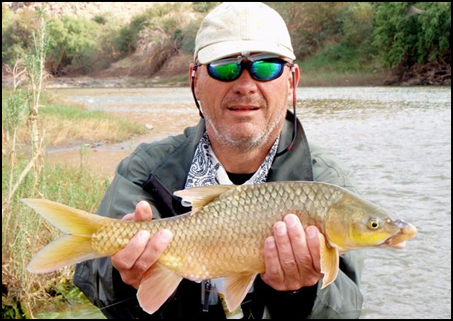 Not only that but Czech nymphing on the rocky sections of the Orange River which the Yellows just love can see you loose six flies in two casts without too much trouble if things go wrong, so quantity is pretty much an essential. Anyway I already have more flies than Mike, I have found my neoprene waders, the tent, the sleeping mat, the large fishing net and a couple of different reels that don’t get hauled out that often and progress is being made. Now I will have to focus on work for a day or two and hopefully by then I will have found a few moments to tie a couple of dozen more patterns and then that will have to do. 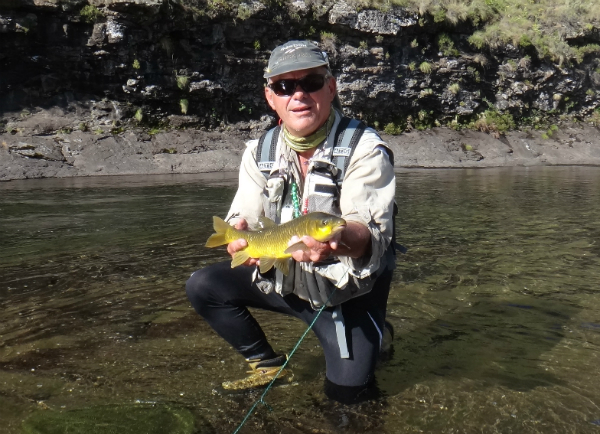 Darn I am excited; there is not always a great deal of finesse in fishing for yellows, at least not to the degree required on our catch and release, crystal clear trout streams. But at the same time one can do serious numbers of fish in a day, end up with sore arms, sore legs and soaking wet from the odd swim for that matter. This is exciting fishing and the possibility of hitting a real lunker is always with one, even if the fish are of more moderate dimensions, five pounders are far from unusual and you will hear your reel scream far more often than on most trout waters.. Then on top of that the scenery is truly spectacular, totally remote and wild in the most glorious sense. We are planning on exploring some new waters, or at least new for us and to be honest we aren’t exactly sure where we are going so it is something of an adventure. 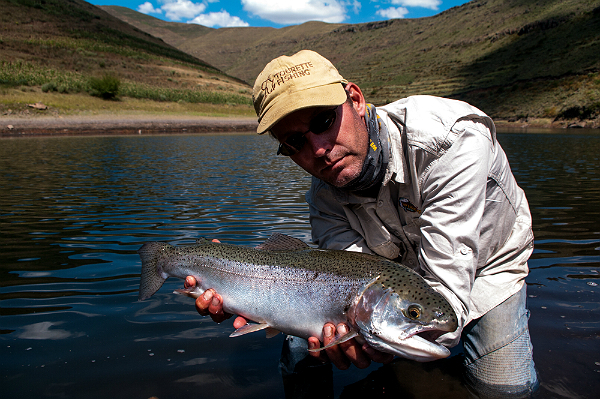 Anyway there are flies to tie, prepare for some great images and fish talk on our return. New Free E book Published. I am really sorry that the previous link didn’t work, sticky fingers more than anything so if you didn’t get what you wanted to please try again. Thanks.